This post was originally published by the Maternal Health Taskforce as part of its “Supporting the Human in Human Resources” blog series, co-hosted by the Maternal Health Task Force and Jacaranda Health. That’s what conditions at her rural health center felt like to Habiba Shaban Agong, a senior nursing officer and midwife in Uganda. But it pained her that her facility was not able to deliver the high quality of services the community deserved. The facility was not well maintained, water was unreliable, waste was not segregated. For starters, there were not nearly enough health workers to meet the demand. Each department had only “about one human resource working day and night,” Habiba says. “They get exhausted, and that can hinder service delivery.”And there were other challenges. The facility was not well maintained, water was unreliable, waste was not segregated. There wasn’t adequate equipment in the wards. Beds were broken and too few in number, and mattresses were torn.“As a patient, you wouldn’t like to stay in a dirty environment,” Habiba points out. Many staff arrived late or did not show up at all. The district health officer recognized Habiba’s potential. “He thought I was one of the health workers who could go for training in leadership and management,” she says. Habiba joined several others to form Dokolo District’s team in the Human Resources for Health Leadership and Management Program, intended to strengthen Uganda’s decentralized health systems. Two USAID-supported projects led by IntraHealth International—the Uganda Capacity Program and the global CapacityPlus project—delivered the program in partnership with the Uganda Ministry of Health. Infection control measures were implemented. A system for segregating waste was set up. A new incinerator was purchased. Habiba’s supervision became more supportive, and discussions with staff helped decrease tardiness and absenteeism. Small rewards, such as a chicken, are regularly given to selected staff to demonstrate appreciation and increase their motivation. .“We used to get only about five or ten patients (per month) who delivered in our facilities,” says Habiba, “but last month we got more than 60 deliveries!” And child mortality is decreasing. “In the pediatric ward, during the last three months we have not observed any death at all. ”Habiba is also happy that the Ministry of Health’s successful advocacy convinced Parliament to allocate $20 million to recruit more health workers. Dokolo District benefitted by getting 36 new health workers and raising its staffing level from 49% to 84%. The district rose in the national rankings for health service delivery, from 57th to 11th in the country.Empowered health workers can improve maternal and child health, one facility at a time. To read other participants’ perspectives and learn about recommendations for adapting the leadership and management program to other contexts, read the related publication. 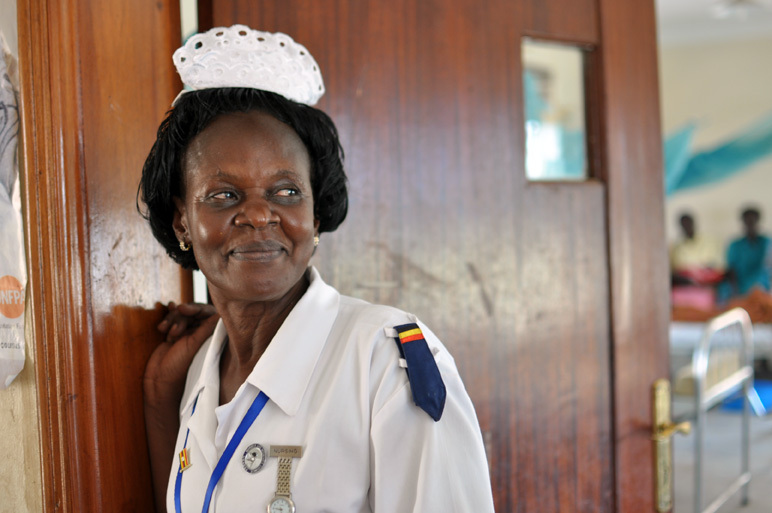 Meet Habiba in a short video, “That’s Improvement!”: Uganda Focuses on Health Workers. Habiba Shaban Agong and a client with newborn twins. Photo by Sarah Dwyer. Habiba Shaban Agong, a client with her baby, and Nurse Connie Achar. Photo by Carol Bales.